What better way to kick off 2018 then with this best album by GENERATIONS from EXILE TRIBE? Check out the music video for "BIG CITY RODEO" above. On the 9th, Nine Stars - (formerly known as Kyushu Boys) younger brother group to MAG!C☆PRINCE - will release their debut single "FLASH". On the 17th, Da-iCE will release their 13th single "Tokyo Merry Go Round". The single also includes the coupling track "Waruguchi" which was used as the theme song for the drama Hana ni Kedamono. 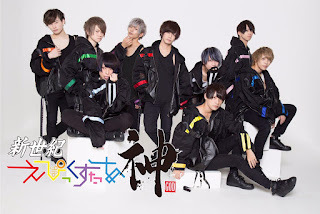 Otaku male idol group Shin Seiki EPIC STAR Kami will release their first physical single on the 23rd titled "Epic Quest". On the 31st, MADKID will make their major debut with "Never going back". On the same day, EBiDAN group SUPER★DRAGON will release their 3rd single "Monster! ".